The article below is written by Christina McMellon a PhD student at Edinburgh University’s Centre for Research on Families and Relationships. Her research explores how young Lao volunteers in Vientiane understand and experience happiness and she has recently returned to Scotland to write her thesis after spending 2 years in Vientiane conducting fieldwork. This piece was originally part of an occassionalblog which can be read at www.christinainlaos.wordpress.com. For more information, Christina can be contacted atchristina.mcmellon@gmail.com. A man who is wise and kind has disappeared and I am sad. I don?t really know what else to write, but there is nothing else that I can do. SombathSomphone and I first met briefly in 2008. I?m sure that he doesn?t remember that meeting but he told me about PADETC – the community development organization that he had started and of which he was then Director – and I decided that if I ever had the opportunity to come back to Laos I wanted to connect with him and with PADETC. At that point I was unaware of Sombath?s long background of promoting happiness in development, but I made contact again when I returned to Laos at the end of 2010. We connected over a couple of long and inspiring conversations about happiness, particular after we discovered a common love of the teachings of ThichNhatHanh and of Plum Village. I started to work more closely with Sombath in December 2011 when we collaborated to show the international documentary ?Happy? to as wide a Lao audience as possible. Then, in a quick conversation in February 2012, the idea for ?Happy Laos? was born and a piece of work that took up a significant amount of my last 6 months in Laos was begun. I have talked about Happy Laos at length on here, but only in terms of trying to persuade you to part with your cash. I never actually shared the final film, which was very remiss of me. So, here it is. Please watch it and pay particular attention to the gentle mannered grey-haired ?happiness advocate? who talks about (among other things) how we need to stop looking outside ourselves to find happiness. We (I hope I can talk on behalf of the many people who were involved) are very proud of the finished short film which encourages Lao people to think and talk about the things that truly make them happy. Maybe I?ll write more about this another time; everything is interconnected, but this is a post about Sombath. 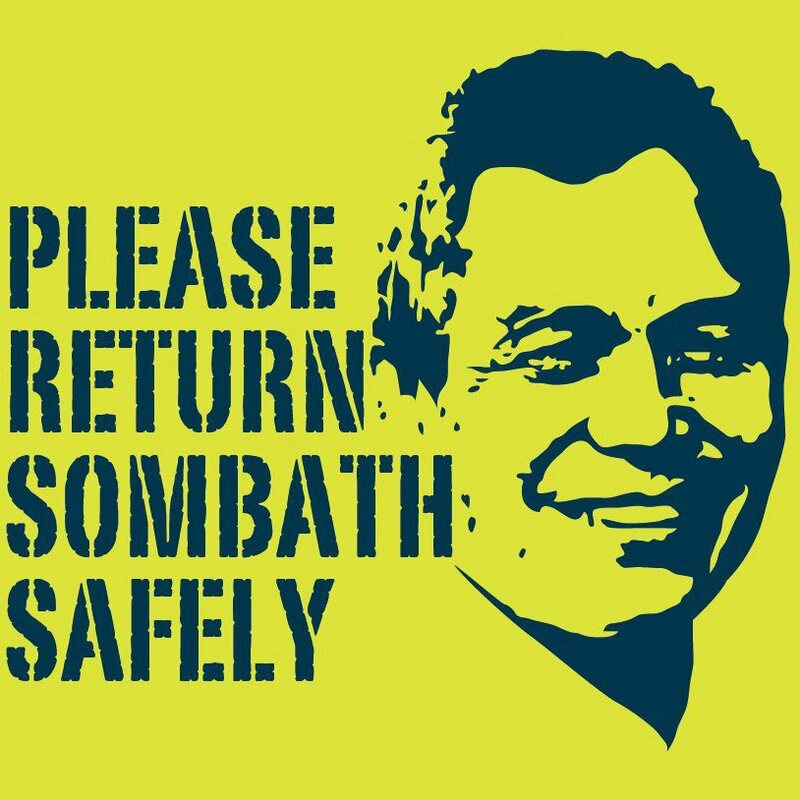 Sombath has been missing since 15 December 2012 with absolutely no word from whoever is holding him and no update on the promised government investigation into his disappearance. There is so much else to be said and nothing else to be said. I don?t want to speculate about motives or politics or implications because all of this is unknown and I am a very long way away. What I want to do is to focus on Sombath and to remember that a wise, kind, determined, gentle, sometimes infuriating, always inspiring man is missing. I keep wondering what advice he would give in this situation. In May 2012 I interviewed Sombath for my research. As in all my research interviews I started by talking about research ethics and, in particular about how the interview was confidential. With a twinkle in his eye Sombath asked me why he would want his ideas to be confidential, requesting that I summarise everything that he would say so that he could widely share his views. I laughed. It was typical Sombath – on the one hand it made perfect sense but on the other it felt in potentially messy conflict with the ethical guidelines that I?d signed up to in the UK. He flattered me by claiming that I (a native speaker) could write it in a way thatwas much clearer in English language than he. I muttered something non-committal and thought about the exchange several times over the next few months, but he never asked again. In very different circumstances, I now come back to that interview transcript. I?ve talked to my supervisors and decided to share. Ethics are ? or at least should be ? 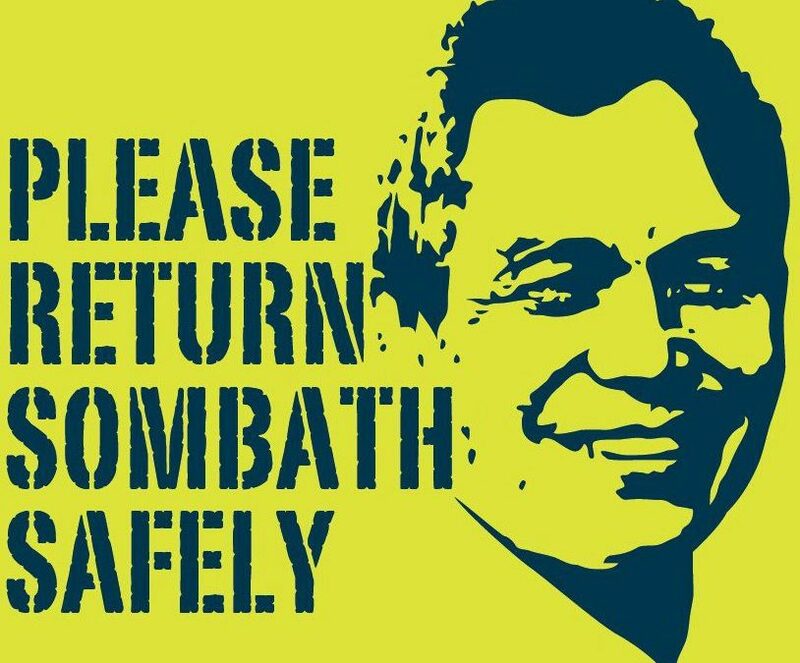 about doing the right thing and the only right thing I can do just now is to add my own tiny voice to all the amazing people who are working to keep Sombath in the public eye and raise awareness of his work and philosophy. So I?ll finish this post with a (tidied but otherwise unchanged) extract from that interview and let him explain his view of happiness in his own words. Sombath: People perceive that happiness is something magic, something superior, and therefore we need to look for the answer. but the answer is in everyday life? Christina: It’s right in front of us? S: It’s right in front of us – but we look through it. C: How do you define happiness? S: Well, people define poverty, right? People define stress. Happiness? ?there is a baseline happiness which is having no poverty or no stress?but if you want to be REALLY happy?then there are many types of happiness. People tend to think only of sense happiness…tastes good, feels good, looks beautiful, is good to your ears and so on. But these senses are reacting to something…you sense something and you have a perception of whether it’s true or not and that perception is a judgment which depends on your culture, your past experience, your age…you make a judgment about whether that’s good or not good…if it’s good then you want it. Taste spicy food? Wow…that?s good? but if you’re not used to hot food you might think it’s terrible! These are the senses? happiness and we can become addicted to these sensory happinesses. But they are temporary because your senses will never be the same…as you grow older what you used to eat is no longer good? when you were young your taste buds were more for sweet taste but as you grow older you enjoy bitter tastes. Things change…so that is happiness but it is temporary happiness depending on your situation, what age you are, your relationships and so on. It is happiness but it is superficial happiness? if we can go deeper than that, then we can find happiness that does not depend on the senses. C: What does that deeper happiness depend on? C: So in a sense the deeper happiness is in realising that the thing isn’t permanent, it is in the non-attachment, being able to let go? S: It is in the non-attachment. But that doesn’t mean you should not enjoy your senses…just with awareness that they are temporary. Otherwise you attach to something that is good?you desire it?want more of it? but then there is also something painful that comes with that?because nothing is permanent. If you don’t know it is non-permanent, when someone says they loves you you say “ahh she’s gonna love me forever” right? But there’s no such thing as forever and then, if you don?t have awareness, it’s painful when you find out that’s not true…so your happiness caused you pain. You should enjoy with awareness. This is not a pessimistic view but at the same time it’s not an optimistic view. There are good times there are bad times. If you can accept that then nothing really moves you. C: How does that fit with PADETC and with development? Where do you see happiness should fit? S: Well, I think this ability to understand things is very important. I keep stressing that we need to understand the present, learn from the past and based on these two things we should strategise for the future. But you know the future is always going to be changing, it will never be what you expect and you should not expect it to be the way you would like it to be. And if we understand this when we work, we will not be too attached to the things that don’t work out because we will understand why they don?t work?but if something works we also should not be too excited about it but simply be aware of the conditions that makes it work. Those conditions will not be the same in every situation and, if you understand that, you will be continuously motivated to do things that are not to satisfy yourself, but really are for the common good?and that common good depends on all the conditions that surround the situation. C: And that non-attachment maybe allows or opens up the possibility for things happening that don’t we don’t expect to happen, right? S: Yes, and the deeper happiness comes in creating an environment or conditions where everyone can be happy. You will see the greater reward, when you see your fellow humans?your partners? really enjoying life?being very calm? and this will make you even more happy. But you can become attached to doing good also too…if you are doing good without expecting anything in return that’s non-attachment. C: Do you think that is why there is some resistance to the idea of happiness in the development world? S: I think it?s because we are not used to think this way, you see it’s just perception, your mind is lured into accepting what it?s told, so it is important to train it to really analyse things, especially to analyse yourself. We are always judging things outside us, we have been trained to distract ourselves from the self with what is out there. But then the self becomes based on what is out there. But, out there, there is always change so we will never find rest. So it’s all about the mindset. If we only look outwards we are like rats on a wheel? C:?and it’s really interesting what you say about that rat in the wheel could be an attachment to doing good? because it’s a very familiar idea to me that that rat in the wheel is a attachment to getting more money or having more things or having a good status?.but attachment to doing good, to making the world how you want the world to be? that’s interesting?. S:..yes that’s attachment, because you are going to be disappointed (laughs) for sure you are going to be disappointed. C: What do you think is the connection between doing good and happiness? S: I think doing good is really part of happiness because down deep if you feel that you are doing good you will be happy. S: Yes! That’s because the west has focused too much on a shallow and individual version of sensory happiness. Happiness is about understanding how connected we are and how temporary everything is?about sharing good times and sharing the pain?it?s about giving? S: It’s all relational. It all depends on the particular conditions and connections. S: If you do something to make another person happy it is likely that they will return the same kind of positive thing to you. When the west talks about happiness it’s individual sensory happiness, it’s only one sense at a time but if you have two or three senses together…wow…you feel really high (laughs). But here actually, you know, like we said earlier, it’s just doing mundane things?but sharing them with other people and being satisfied with them. If you get greedy you have to continue to be greedier and greedier to be happy- it never ends. C: So there’s an irony where you think that you are doing what you need to do to make you happy but actually what you are doing in keeping you stuck in a cycle? S: Yes, we have the wrong path. We have the wrong path and that path is defined by our mind when we have no control over our mind. That is the case for 99.9% of the people. C: And we are right back to the mindfulness again?